Yes, But Are You Having Fun? Irv Peckham, who teaches writing at LSU and whose work I have always admired, stirred up a lively conversation on the WPA-L email list this week (is an email list primarily of US university writing teachers). Irv posted several emails in which he talked about how he was organizing his current writing course on “Life Writing” to try to find a way for the students to enjoy the experience of writing, for them to have fun. (You can see Irv’s blog about this class and these issues here.) This position definitely appealed to me. I’ve written several times and places in the past about the motivations of pleasure in writing (and so many other things we do voluntarily) and how much of what students do outside of the classroom with writing and reading happens because they find pleasure in it. I don’t just mean a sensual, immediately gratifying pleasure, but the pleasure of craft, the pleasure of accomplishment, the pleasure that comes with engaging a challenge and then accomplishing what you set out to do – what one of Irv’s students called “hard fun.” The thing is, this kind of pleasure is so often predicated on having some control over the challenge, over the goals you’re trying to reach. It’s why students who talk of hating writing when they’re inside school having to complete assignments for which they see no purpose or relevance, will spend hours writing fan fiction. An interesting thing happened on the WPA email list after Irv made his post, however. 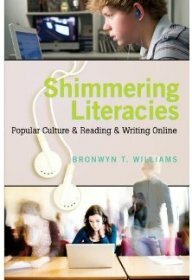 The responses very quickly became about whether writing courses should allow for “personal” writing or only be about more “academic” genres. Besides being reductive about those categories, what I found fascinating is that very few people bothered to talk about fun, about pleasure. I think, in part, people took the discussion that direction because they mistakenly conflated pleasure as only possible through personal experience and displays of emotion. But I also think that it probably made some people uncomfortable to think we should be thinking about teaching as, in part, creating the conditions for enjoyment, for pleasure, for fun. Those concepts just strike some people as, by their nature, to lack rigor, or intellectual engagement, or “value” in terms of writing in the academy and beyond. Pleasure and enjoyment are inaccurately (and unfortunately) conflated with ease. Yet, as the research I’ve been doing recently – the observations and conversations I’ve been having with students – shows me is that perceptions of agency are dependent in part on emotional dispositions that include a sense of control and the opportunity for the pleasure of craft and accomplishment. If we want students to embrace writing (and we do) then we ought to be thinking, and not shrinking, from conversations about how to create opportunities for them to enjoy writing. The writer’s basic job is not to say what he already knows but to explore his own experience for his own meaning. His experience may be in the library or in the pub, but at the moment of writing he uses the tool of language to discover the meanings which exist in his experience. As he uses his language to try to put down on the page what he thinks he means he keeps changing the words—he thinks. As his writing develops under his hand his words reveal his meaning, an order evolves as his mind uses language to expose what is significant in his experience. Discovering the meanings that exist in experience – wherever that may be – involves control, agency, pleasure – fun. A few things: Since I started teaching, and reading about other teachers, I’ve never understood this separation of rigor from “fun.” It seems to me that I can always determine when my students, or anyone for that matter, enjoy what they’re writing at least to some extent, because the writing reads better. It’s more involved and unpacked. They become inquisitive about the assignments and strategies for writing. I also wonder what the objectives are overall for students of instructors who are opposed to viewing academic writing as fun… as if it they never found anything fun about it.